Also, have yet to try 'bottled' Italian dressing - I sort of make my own rendition, but I would be interested (though i do not believe I can find the brand referred to up here in Canada). As if such a thing could exist..."too much garlic". I know, but in a cold brine, raw garlic can become very dominant! I used to make up my own vinaigrette with olive oil, but it would solidify in the fridge. I would have to take it out of the fridge for an hour or so to get it liquefied. One day I happened to notice the Kens Italian Dressing and Marinade, still in liquid form, right next to my solidified mushroom jar and the rest is history. It makes the process easier and the end product easier to use and still is quite good IMO. I have the same issue. Coagulated oil floating around in bits and pieces...Not a pretty sight! Well for a smidge over $125 you could get nine bottles of it from Amazon.ca. Free shipping by the way. Not quite as easy as store bought dressing, but I use this mix from The Spice House. I keep a jar in the fridge at all times and it's never solidified on me. The ingredients in Ken’s and the ingredients in Kraft Zesty Italian are not too different. And Kraft is available almost anywhere. I have many fond memories of Kraft Zesty Italian growing up as a kid, so that might be a nice blast from the past! Newman's Own is a good one, too. I am in AZ and can buy it locally or order it for a reasonable price through Amazon, could send it to you now or once I return to Canada (BC) in April, if you would like. I﻿ keep a jar in the fridge at all times and it's never solidified on me. @Shelby, are you using olive oil with that Spice House mix? No, just regular vegetable oil. 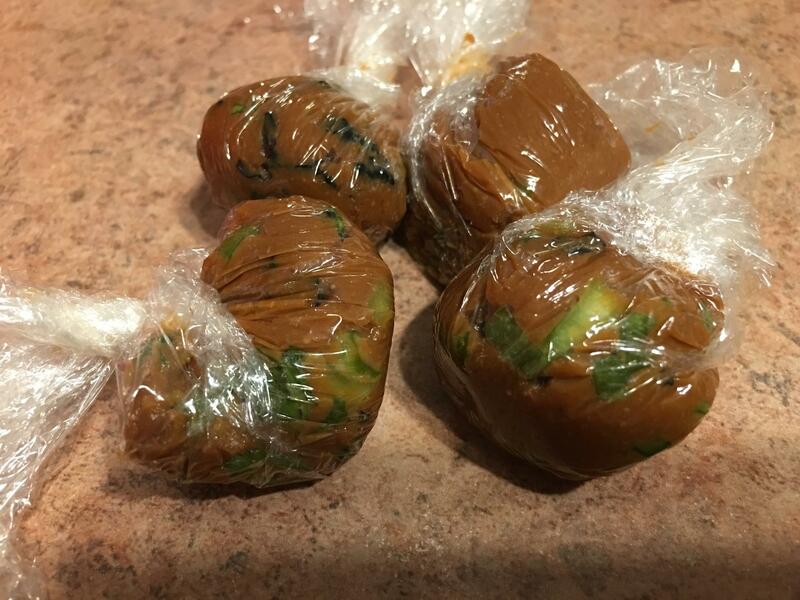 Miso soup bombs. These are red miso with wakame, instant dashi and sliced scallions. I know that miso soup is a breeze to make but it’s even breezier with these. Drop one into a soup bowl and add a cup of hot water and you’re done. They keep well in the freezer. 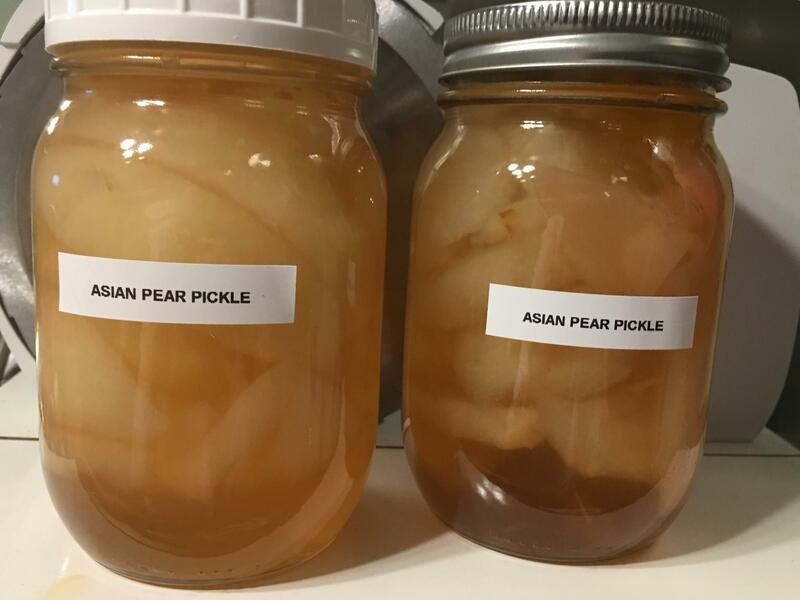 More Asian pickled pears which I made yesterday. This time I cut them into much smaller pieces. I think the brine will have a better opportunity to fully season them this way. I also cooked them a little longer so they were not quite as firm as the last batch I made. They will need a few days to age in the refrigerator before I can give them a fair taste test. Spotted some pork tongues and snapped them up this morning. Into the Morton Tender Quick they went within minutes of their arrival at the house. See you in 2 weeks! I brined some fresh salmon from Aldi overnight, put it uncovered on a rack in the fridge for most of the day today. As soon as we got back from lunch (champagne brunch at Todd English's Tuscany), it went into the smoker with some hickory chips. Much more of a quickle than a pickle, I thought it was a good way to deal with some cocktail tomatoes that were reaching the end of their useful life. @Shelbywill be pleased to know the tomatoes are peeled. 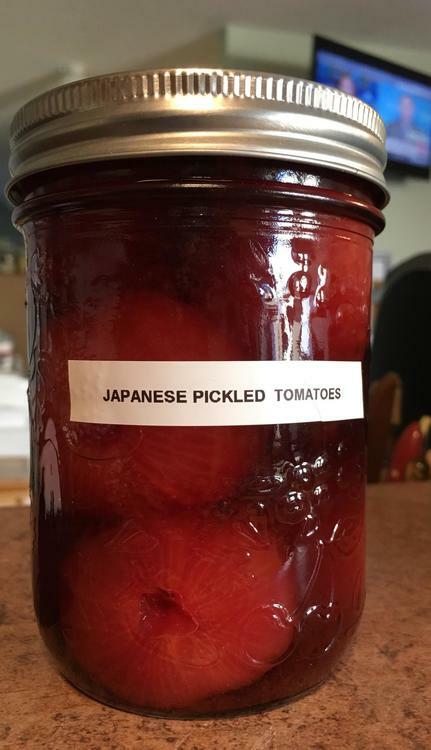 What makes them Japanese you ask. The brine which includes soy sauce, dashi, rice vinegar, salt and sugar. I tasted the brine and had to hold myself back from inhaling it. If anyone is interested here is the recipe. I cut down on the sugar somewhat to suit my own taste. ALWAYS relieved when I know those evil peels are banished. These sound intriguing. Wonder how it would work with green tomatoes? 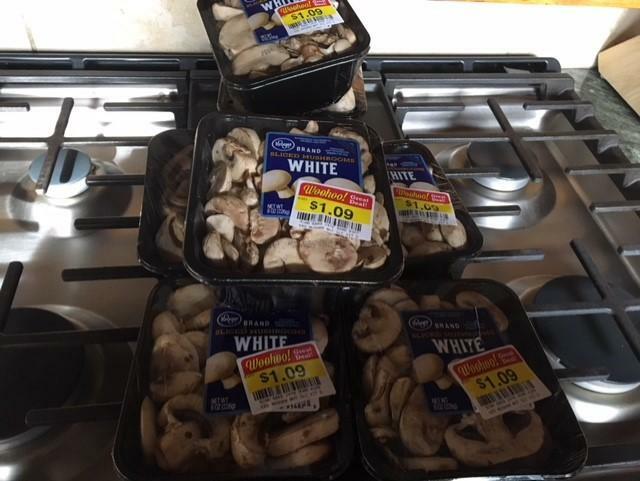 I don’t know but do remember that they are only good for a few days in the refrigerator. Not a reliable method for dealing with a glut of tomatoes. Layered slices of roasted beet and raw turnip pickles. Someone in here -- @ElsieD, was it you? -- posted last fall about harvesting black walnuts. We had them everywhere, seemed like, when I was a kid, but they were typically passed over in favor of pecans which yielded more nutmeat per nut. Walnuts were often left for the squirrels and hogs, although I do remember the "old folks" dyeing cloth with the juice from the outer hulls. I have of late discovered and become a confirmed fan of preserved walnuts. I've found a recipe, here. Be assured I will be on the lookout for black walnuts, which for these purposes should be picked before they fall, while they're still green) and trying to make my own. Anybody tried making preserved walnuts? I don't recall how much these were at Kroger, but I checked Zingerman's, and they ain't cheap. There should be marvelous things I can do with the syrup, too.